After opening two new assisted, accessible toilet facilities, Alton Towers has become the most accessible of the UK’s top theme parks. The Staffordshire venue has become the first of the most popular theme parks to install both a Changing Places, and Space to Change assisted, accessible toilet. Therefore, thousands of people can now relax and spend time at the venue, knowing that appropriate toilet facilities are available for them if required. The Changing Places toilet has been installed supplied and installed by Clos-o-Mat, in addition to existing wheelchair-accessible toilets, providing more space (12m2) with a ceiling track hoist, height-adjustable adult sized changing bench and height-adjustable washbasin alongside a peninsular WC. In addition, Clos-o-Mat also supplied and installed the Space to Change toilet delivers the same equipment in a smaller space (7.5m2) and can be incorporated as part of an existing wheelchair-accessible toilet or as a stand-alone facility. Campaigner Tony Clough MBE, worked closely with Alton Towers Resort’s operator Merlin on the project, and said that with at least one in every 260 people needing additional space and/or equipment to go to the toilet when away from home, it is important to provide facilities for those who need it. Therefore, Alton Towers has enabled the park to be enjoyed by thousands of people who otherwise would have had to cut their visit short, or not gone at all. 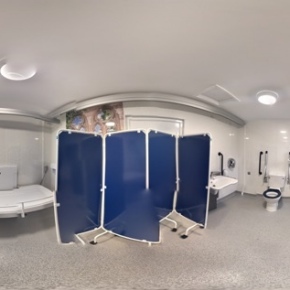 Alton Towers Resort Excellence Manager added that following feedback from guests and consulting an external accessibility auditor, due to the resort spanning over 900 acres, it was decided that both the Changing Places and Space to Change toilets would be installed. A Changing Places toilet is desirable for buildings which have numbers of the public visiting and as a consequence almost 900 have been opened across the UK, since their introduction a decade ago. Clos-o-Mat is unique in its ability to deliver- in-house- design advice, supply, installation, commissioning, project management and maintenance across the ambit of accessible toileting equipment, including the Clos-o-Mat wash and dry (automatic) toilet.